The ship was designed by Scenic’s COO, Glen Moroney, and took three years to design. Onboard, Scenic Eclipse will offer six dining options – hosting a range of Pan-Asian, French and Italian cuisine – four lounges as well as a large spa. 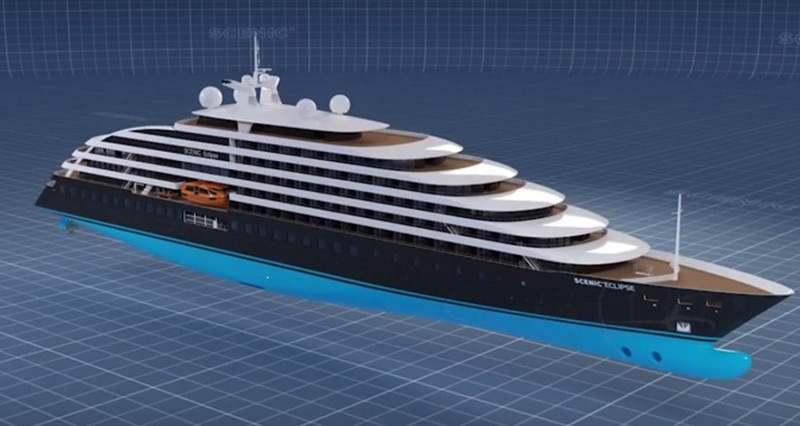 The ship will be equipped with an underwater seven-seat submarine, two helicopters and a fleet of kayaks and zodiacs. The ship will be built in Croatia, with Scenic Eclipse’s maiden voyage departing Istanbul on August 31, 2018. The ship will then sail to Venice. The ship will also visit Canada, Iceland, the Arctic, the British Isles, the Caribbean, Cuba and Antarctica. Length oa. 165,70 m - Beam 21,50 m -Draught 5,30 m.
There is an option for a second wih delivery in 2019.